IT band Syndrome is an overuse injury of connective tissue present at the lateral aspect of thigh it runs along the outer part of thigh extending from pelvis to tibia covering both hip and knee joint when this connective band or tissue rubs against bony prominence due to overuse activities leads to inflammation and irritation of this band causing symptoms. It is also known as ITBFS ( IT Band Friction Syndrome). 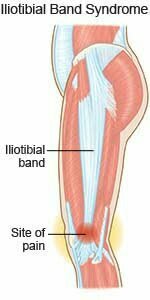 The ITB is not connected to bone as it runs between the Gerdy tubercle and the lateral femoral epicondyle. 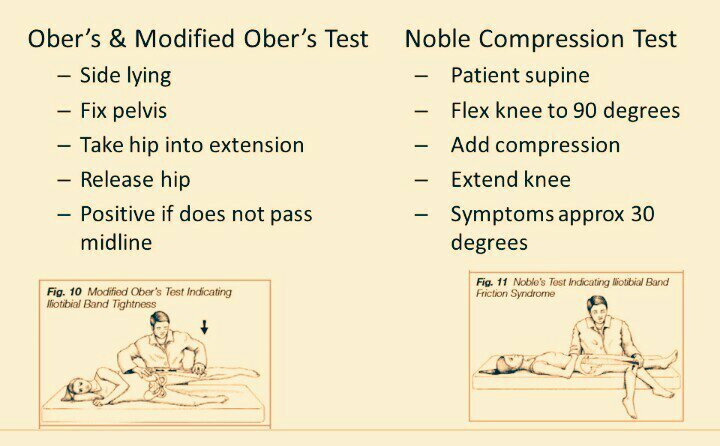 This lack of attachment allows it to move anteriorly and posteriorly with knee flexion and extension, this movement may cause the ITB to rub against the lateral femoral condyle, causing inflammation. Patient with ITBS presents with an insidious onset of lateral knee pain that is present during running. The athlete is able to pin point location of the lateral knee pain to approximately 2 cm above the lateral joint line. Pain aggravates when the athlete climbs stairs or runs downhill. Pain may develop with any activity that places the knee in a weight-bearing position at approximately 30º of knee flexion. Pain at rest and is usually associated with severe tendinitis. Point tenderness is noted upon palpation of the lateral femoral epicondyle, as well as with palpation of a site 2-4 cm above the lateral joint line and at the Gerdy tubercle. Pain may be elicited with knee flexion to 30° when varus stress is applied to the knee. Inability to perform adduction indicates tightness of IT band. Treatments such as ultrasound, friction massage, and ice may also be used to calm inflammation in the IT Band. Iontophoresis, in which physiotherapist uses a mild electrical current to push anti-inflammatory medicine to the sore area to relief inflammation.